Despite there being no one present to witness the falling of 'Toronui', we can be certain the calamitous event resounded throughout the remote corner of Waipoua Forest where it once held domain. 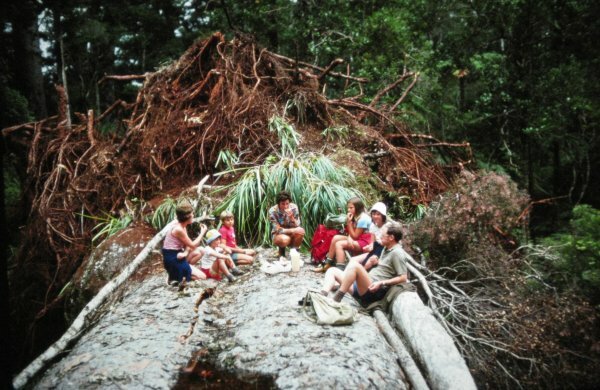 This mighty tree was thought to have fallen in mid-March 1977 but was not discovered until the following April Easter weekend when the Fletcher and Brown families from Whangamata tramped in to see the tree. They later donated the accompanying image of the fallen tree to The Kauri Museum. Those investigating the tree following its demise found it to be largely hollow. Across its diameter of 4.84m, only 10-12 cm at the outside was sound wood with a further 30 cm of wood being decayed. The remainder was hollow so that when it fell it was said to resemble a large cavern. Is it clear from the early images of the tree that Toronui had been extensively bled for its gum, as was typical of many of our great trees. Knowing what we do today about the relationship between wounding and internal decay it should come as no great surprise that this practice would have played a significant role in 'Toronui’s' demise. 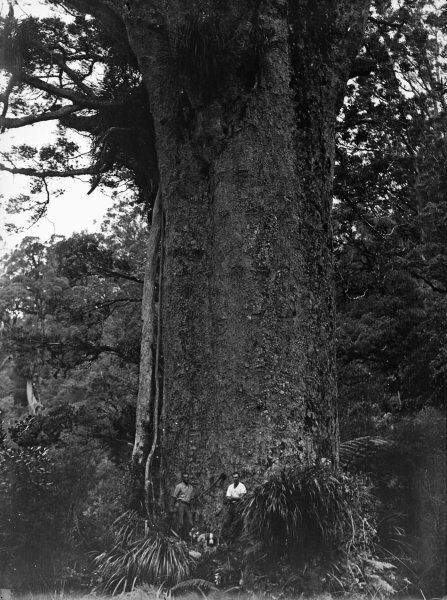 Up until this time 'Toronui' was considered to be the largest living kauri of recent times. 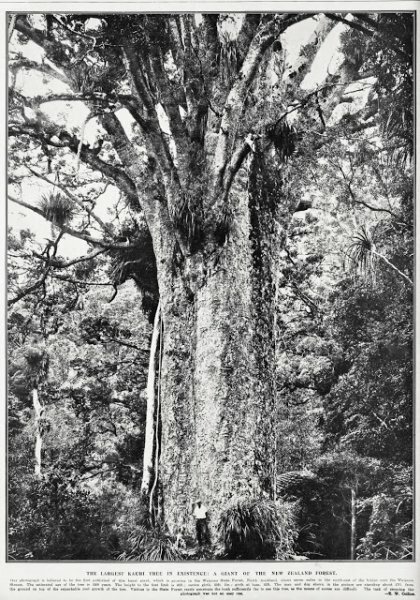 It was said to be a well-balanced tree that was not the thickest nor tallest nor longest clean-boled kauri, but was rated at 286.5 cubic metres of merchantable volume, and so was one-sixth bigger than Tane Mahuta at the time. Only 50 years passed from discovery until the day it fell as a result of the hand of man. One might hope that the tree would finally be left in peace but the final chapter came to be written on another Easter weekend in 1982. A tramping party from the Auckland University Field Club walked in to see the fallen giant only to find that vandals had recently burnt the once-enormous log. 2) Burstall, S.W. and Sale, E.V. (1984). Great trees of New Zealand. A.H. and A.W. Reed Ltd., Wellington. 3) Sale, E.V. (1978). Quest for the Kauri. A.H. and A.W. Reed Ltd. Wellington. Exact method of measurement unknown but the use of abney levels and hypsometers where standard issue in the 70's. The girth was taken 2 m above the top of the pukahukahu (humus) mound, which was itself 5 m above ground level. 31 Jan 1926 Murray, R. & Boys, J. The tree was very isolated. The map marker showing where the trees was located is indicative only.